Sweet Christmas, Luke Cage is looking more badass than ever before in the new teaser for Season 2. On Tuesday, Netflix released a 30-second teaser trailer for the upcoming season and made the release date for Season 2 official: June 22. Luke talks directly to the camera for part of the teaser, boldly daring haters to come at him. “Yo, I’m Luke Cage,” he says. “You can’t burn me, you can’t blast me, and you definitely can’t break me. You wanna test me? Step up! I’m right here!” If we weren’t sure about it before, now we know that Luke Cage is 110 percent done hiding. It’s only a bit ironic because during Season 1 of Luke Cage, the title character was indeed burnt by a vat full of acid, blasted by some Hammer Industries bullets, and generally speaking pretty broken physically and emotionally. But with a newfound bold attitude towards all of his would-be adversaries, Luke looks more like a force of nature than ever before. The trailer ends with someone shouting to Luke as he drives away: “Get paid, black man! Get paid!” This is probably a reference to Luke’s role in Marvel Comics as one of the “Heroes for Hire” alongside Danny Rand’s Iron Fist. The two heroes team up and charge money for their crime-fighting superheroics. Ever since both characters became firmly established in the Netflix corner of the MCU, fans have been clamoring for them to do just that. 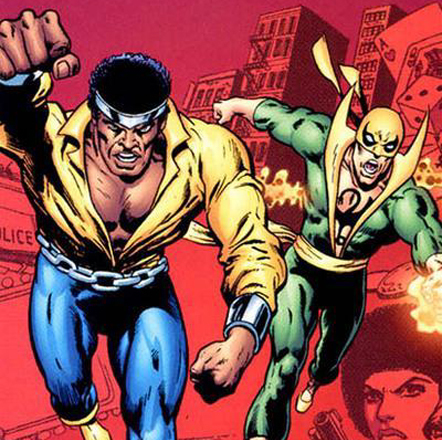 Danny will supposedly appear in Luke Cage Season 2 in some capacity, so whether or not they team-up and charge for their services, it looks like Luke Cage might wind up making a bit of money off his heroic actions.